In the 1930s, the Soviet Union reeled under the purges of Joseph Stalin. Every person knew the terror of losing a family member to the gulag, or to a death sentence. Official government decrees defined truth and beauty. Traditional composers were declared decadent and their music forbidden. Only Beethoven survived the ban. In this environment Dmitri Shostakovich, the greatest Soviet composer, found himself heavily scrutinized. Shostakovich was only 26 when he completed Lady Macbeth of the Mtsensk District (1934). The opera featured a racy plot set to avant-garde music and premiered to critical and popular acclaim. Two years later, three different productions were running in Moscow. Then Stalin himself went to a performance. The next morning the state newspaper Pravda condemned the work, saying it corrupted the Soviet spirit. The opera disappeared overnight and every publication and political organization in the country heaped personal attacks on its composer. Shostakovich lived in fear, sleeping in the stairwell outside his apartment to spare his family the experience of his imminent arrest. Unsure about its reception, Shostakovich rejected his own Fourth Symphony while in rehearsal. Instead he premiered Symphony No. 5, obsequiously subtitled "A Soviet Artist's Response to Just Criticism." As required, the work displayed lyricism, a heroic tone and inspiration from Russian literature. Still, many hear a subtext of critical despair beneath the crowd-pleasing melodies. Instead of writing in the approved ultra-nationalist style, Shostakovich wrote his Fifth Symphony on the model pioneered by Beethoven; he begins his symphony with a sonata, albeit with a hesitant feel. By the third bar of the piece things goes wrong. The music breaks off abruptly and shrugs its way downward to a dead end in an implacable repetition of three notes. This pattern recurs throughout the symphony: assertive statement, apprehensive retraction, dead end. The next theme is derived from a folk song recognizable to the Soviet audience. By changing just one note, however, Shostakovich shifts the meaning of the music. He fulfils the official mandate of celebrating Slavic culture, but the minor shift suggests emotional shadings beyond simple admiration. More drastic changes of mood come from cutting between extremes of range and instrumentation. The piano and basses lurch in with a version of the dead end theme, followed by winds, brass and percussion. The music becomes militaristic and drives forward. The strings and winds burst out with the sad tunes they played at the beginning. The brass and percussion hammer home what seems to be the ultimate dead end. Finally, other themes tentatively make their way back to the opening theme. In the last bars the opening motif returns, scored to suggest that the struggle isn't over. When he was eight years old, Shostakovich's family moved into a comfortable apartment in St. Petersburg. In the city he wrote and played music for the theater, ballet, circuses—and the movies. 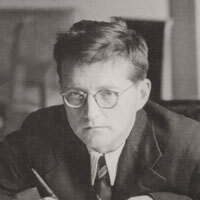 Shostakovich wrote the music for over thirty films, including a science fiction melodrama, Aelita: Queen of Mars (1924). The second movement of Symphony No. 5 is drawn from the same goofy, ironic material as his film scores. The movement is a spoof on waltzes. Shostakovich draws a musical picture of a dance floor. There are peasants in their heavy boots, a wise guy on his squeaky clarinet, and a deluxe dance master with his little kit violin. In the period of Stalin's brutal purges, authorities interpreted crying in public as criticism of the regime's actions and a punishable offense. Despite this, the third movement of the Fifth, a requiem, made many weep openly at its premiere. Shostakovich's audience would have recognized the piece's references to the liturgy of the Russian Orthodox Church with the strings arranged to give the impression of a choir. An oboe soloist, accompanied by a shiver of strings, plays the loneliest tune in the symphony. The full force of the lament bursts out as the double basses shriek. Then the rest of the orchestra screams into the noise, coming at last to another dead end. As in the first movement, the music wanders its way back to an exhausted close. Shostakovich lost three close family members to the prison camps. In 1937, Shostakovich himself was summoned for interrogation. Ironically, Shostakovich only escaped because his interrogator was arrested before his appointment came. For the rest of his life Shostakovich had to issue condemnations of other composers, just as they had of him. Often he wrote a piece that mattered to him, only to hide it for years. In a traditional symphony, we might expect a brisk march at this point, sweeping us on to victory. Instead, a dead slow march begins. Audiences recognized the musical reference to Boris Godunov – the opera in which crowds are forced to praise the Tsar.